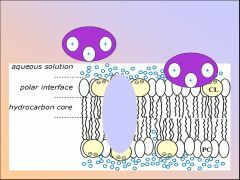 Interactions between the two major membrane components – proteins and lipids play a key role in a wide variety of cellular processes, including signal transduction, intracellular transport, enzyme functioning, energy conversion in the cell, antimicrobial defense and control of membrane fusion. 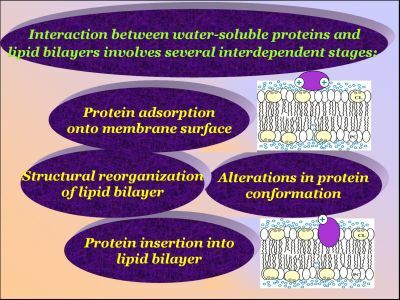 One approach to elucidating the nature of protein-lipid interactions is based on the study of model systems, composed of self-closed lipid bilayers (liposomes) and isolated proteins. 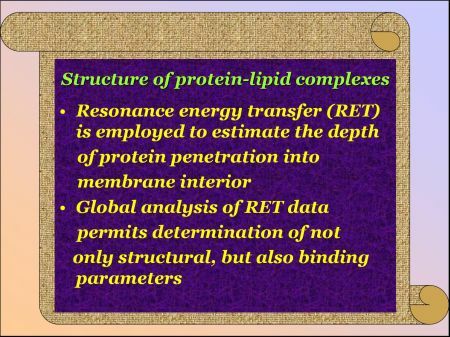 Our research efforts are focused on in-depth examination of the model systems whose protein component is represented by cytochrome c, lysozyme, hemoglobin, ribonuclease A or albumin. 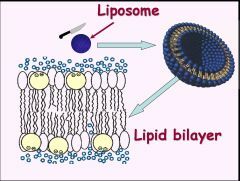 Liposomes are formed from zwitterionic lipid phosphatidylcholine and its mixtures with anionic lipids (cardiolipin, phosphatidylglycerol, phosphatidylserine) and cholesterol. 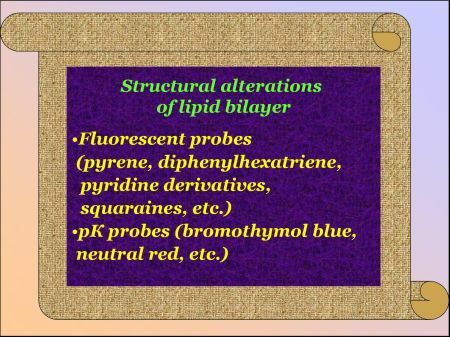 Varying the proportion of different lipids and environmental conditions allows us to bring out particular mechanisms by which soluble proteins interact with lipid bilayers. 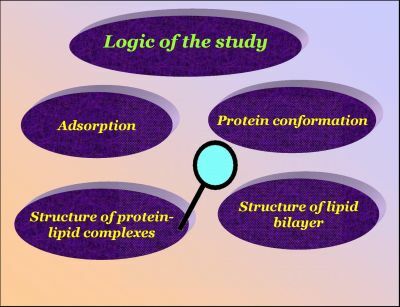 Logic of the study is dictated by the multistep character of the protein complexation with lipids. 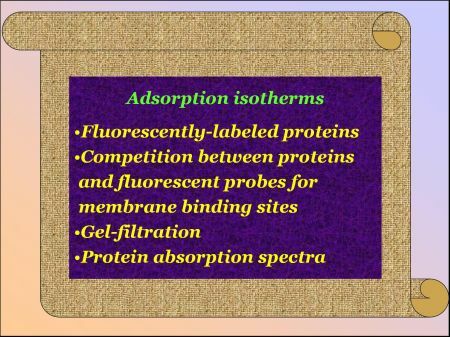 We place into focus of attention i) adsorption process; ii) protein conformation; iii) bilayer structural state; iv) structure of protein-lipid complexes. 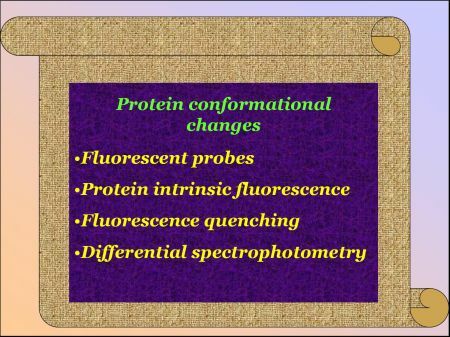 The main techniques employed are fluorescence (intrinsic protein fluorescence, fluorescent probes, fluorescence quenching, resonance energy transfer) and absorption (differential spectrophotometry, pK probes) spectroscopy.